Do you sometimes wonder if your outfit is appropriate for your age? If so, you're not alone. I often see clients who want to know how to dress appropriately for their age. A commonly held belief is that in your teens and 20s you can get away with wearing anything, but by the time you hit 40 it's time to cover up and hide your body. However, while you may have a wider choice of styles that work for you if you are young and slim, the truth is that no-one looks good in everything regardless of their age. So, how should you dress in your teens, 20s, 30s, 40s, 50s, 60s or 70s...? Great grooming -- this includes good personal hygiene, looking after and maintaining your clothes, makeup and hair. Make sure your hair is in good condition by having it trimmed every 6 to 8 weeks and using good quality shampoos and conditioners. A contemporary hairstyle is one of the keys to looking good at any age. And if you're going grey, having your hair professionally colored is an easy way to look younger. If you're not sure what styles are "in" try looking at fashion magazines, celebrities and online hair style sites. It also helps to have an understanding of your face shape and the styles that will suit your face. Typically when you're over 40 you will look better with hair that is shoulder length or above, kept off the face, in a style that has some layering to give your hair lift and movement. A good hair cut is like an instant face lift! When was the last time you updated your makeup and skin regime? Makeup fashions change as much as clothing fashions and a change in this area is also a great way to keep looking contemporary. How to Dress When Everything Changes? Your body changes shape -- as well as gaining or losing weight at different times in our life there are 4 main changes a women's body can go through, the '4 stages of eve' are: puberty; after child birth; menopause and around 75. Men go through only 2 of these changes: puberty and around 75. In addition as we age the effect of gravity on our spines mean we gradually get shorter. And our skin becomes drier and looser, so it becomes a good idea to cover more of our skin than when we were young and firm. Upper arms, decolletage, thighs, knees and necks are typical problem areas. So clothing shapes and lengths that worked for you one decade may no longer work on your current body shape, proportions and condition. Make adjustments to the coverage of your clothes to ensure you're skimming over the areas that you need to hide, but don't forget to highlight your best features as well! In your teens and 20s it's good to 'play' with your appearance and to experiment with colors and clothing styles. By the time we reach our late 20s we've typically worked out some things that work for us. However, if these were discovered accidentally rather than being based on an underlying knowledge of why things work for us, it will mean that when things change we will be lost again! You'll know that something is wrong with your current look, you may feel you're stuck in a style rut or dressing too young or too old, but you won't know how to successfully change it. It's important to have at least a basic knowledge of the 6 elements of style above. That way when things change you'll have some basis for understanding how to adjust your appearance. The main point is to periodically assess your grooming, your shape, your coloring, your personality, your lifestyle needs and your clothing choices and make adjustments to ensure you continue to look good. For further help with how to dress well use my image consulting services, ask me a specific style question or contact me. Contrary to popular belief it's not just women over 50 who ask me how to dress appropriately for their age. 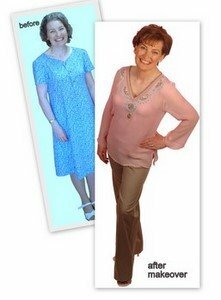 The links below are answers to readers' age related dressing questions and articles on what to wear at specific ages. How can I start to change my style? 22 and feeling old fashioned. Evening wear for a 44 year old? How to be a stylish summer pear at 48? How to be a stylish pear (over 50, over weight and not sophisticated or classic)? Early 50s what length leggings should I wear? Over 50 can I wear leggings? Is it age appropriate at 54 to wear young styles? Christmas party outfit ideas. Age isn't specifically mentioned in this article, but I'd wear all of them and I'm in my mid-50s (some are actually my outfits). Nearing 60, what can I wear instead of jeans? What to wear in your 60s? Are bright blouses suitable in my 60s? How do I dress my age (62) without looking frumpy? Dressing modern for apple shape with large bust (62 years old)?